Gold & Glow is an anti-aging skin treatment that delivers nutrients and hydration to your skin. Alainn’s ‘Gold & Glow’ uses revolutionary new painless micro-channelling technology, that delivers a customized skincare formula to increase your luminosity and give you an overall glow. 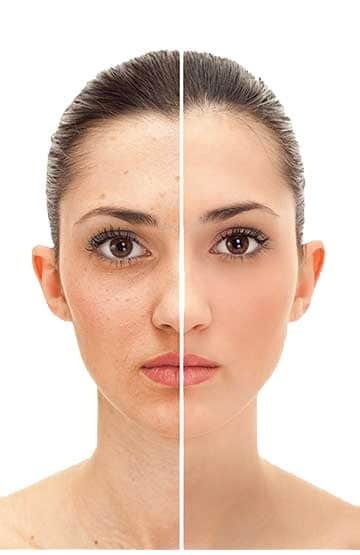 This is an ideal treatment for people with both aging skin and also for those who want to delay the effects of aging. It is a great way to invigorate and stimulate the skin. Extra fine 24-carat gold plated needles (thinner than a strand of hair) deliver gentle touches to hard to treat areas of the face, which was previously difficult and uncomfortable to do using conventional needling methods. During an individual evaluation session, the aesthetic physician builds patient-tailored medical grade formula of customized solutions which may include neuromodulators, epidermal growth factors, hyaluronic acid, peptides, and multivitamins. These solutions are then painlessly delivered 600 micrometers deep into the dermis, evenly across the whole desired surface, leaving virtually no area untreated. While normal commercial skincare products and traditional facials are only able to treat the skin at its surface, Alainn’s Gold & Glow Face Treatment will help restore skin health and beauty from within. The Gold & Glow procedure has zero downtime. Gold & Glow personalized treatment can be used on all parts of the body, including the: face, neck, décolleté, arms, hands, legs, abdomen and back. The Gold & Glow procedure is completely pain-free. Individual result may vary. Patients usually start seeing results a month into the sessions. An average Gold & Glow procedure takes about 40 minutes. Alainn’s Gold & Glow Face Treatment Package comes with a set of 8 bottles of customized solutions, delivered over 8 sessions. It is recommended to do weekly treatments for the first 4 sessions, followed by every 2 weeks for the remaining sessions.